"A New Software Tool Has Just Been Released That Allows Internet Marketers To Manage Multiple Profitable Products With Ease Increasing Their Bank Accounts Substantially. "Now You Can Treat Your Business Like A Business And Increase Your Profits All At The Same Time." If you are like me, then you know how many ideas and niches there are just waiting to give you loads of cash. The problem is there isnt enough time in the day to continue tapping these cash machines. Lets face it, time is money. I finally developed my own easy management system that allows me to keep on top of several projects so easily it really makes life so much better. The software that was developed was created to be as simple as possible giving even my father a chance to make money online. Believe me, if my father can use this software than anyone can. Let me introduce you to Tiger Project Manager. Now you can add as many projects and project tasks you can think of. See all projects and tasks on one screen giving you a birds eye view as well as the detail needed to complete those projects as fast as possible. Get those projects out before a competitor beats you. "The software was built with the internet marketer in mind.."
It doesnt get any easier than this my friend. o Create unlimited project tasks for each project. o Keep track of project and project task by setting different statuses. o Use the many internet marketing task types built in. o View the task timeline keeping you on time and within budget to maximize your profits. o View project budget and timeline charts that can be saved in html, mht, pdf and excel. o View project task budgets and timelines that can be saved in html, mht, pdf and excel. 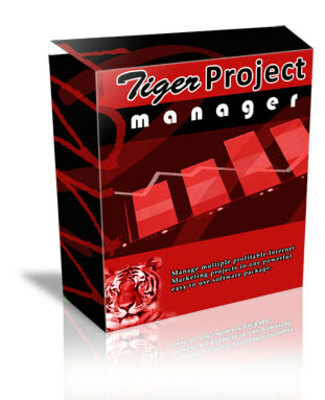 For a limited time I am also giving you the opportunity to have Resell Rights to Tiger Project Manager. Use this software to build your business and give your customers the same opportunity by selling them a copy as well. They will love you for it and you will build a reputation of selling high quality, easy to use products. o Sales page graphics seen on this sales page. o Camtasia videos demos of Tiger Project Manager. o I support all your customers using my support forums. *all New! * Special Offer Manager - Master Resale Rights Included!